I recently returned from a trip to Disney World with my family. It was an exhausting, whirlwind of a weekend. Amidst all the crowds, sights, and sounds, the experience really got me thinking about how our expectations can shape our experiences. Despite the expectation of Disney World being “The Happiest Place on Earth,” I noticed a lot of frustrated kids and parents. I know it is more difficult for kids to manage expectations and disappointment, but I couldn’t help but wonder about the rest of us. Wouldn’t most experiences be much better if we were more mindful of how we approach situations, our expectations and our reactions? Wouldn’t our lives be better if we could experience more gratitude? In the book, The Gifts of Imperfection, Dr. Brene Brown talks about how to cultivate joy. She shares the idea that we can choose to focus on what we’re grateful for, rather than focusing on what we don’t have, or what we’re afraid of losing. “Count your blessings” is a phrase we’ve all heard ad nauseam. It can be easy to forget on days like that day at Disney – surrounded by thousands of people and whining kids on a hot day and spending $14 on a hot dog. But feeling and expressing gratitude has numerous scientific benefits including better sleep, improved emotional wellbeing, decreased depression and improved physical health. Ready to manage your expectations, experience less frustration, feel more grateful and cultivate joy? It takes practice and a conscious effort to change our thoughts. We can change how to respond to moments to, “Yes, I’m disappointed that this wait is long, but this is a minor frustration and a first-world problem.” The truth is, when we feel entitled to something, we often don’t fully appreciate it even when we have it. Practice more positive and rational self-talk when you are feeling disappointed or frustrated. When you expect your spouse to regularly do a certain thing or be a certain way and they don’t live up to your ideals, you find yourself frustrated, even angry. It can be toxic to your relationship. When you recognize that you must express your wants and desires rather than feel entitled, your happiness, and your spouse’s happiness will be greater. Accept that life is not always fair and we won’t always get what we want. Now there’s a tough sentence to read. Although we all know it to be true, we often try to deny the reality and fight to have things our way. That’s just human nature. 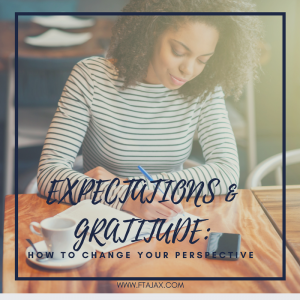 It’s okay to not always get want we want and accepting that while making a conscious choice to notice opportunities for gratitude, even in the midst of less-than-perfect circumstances, is one important element in cultivating a life of joy. If you find yourself stuck in a pattern of negative thinking and having trouble shifting your expectations, disappointments and anxiety on your own, we can help you. Changing your mindset quite literally requires you to rewire your brain. It’s hard work and often can’t be completed overnight or by yourself. Call or book an appointment online with us to start your journey to feel greater happiness, experience more gratitude and well-being. You might also find our blog post, 5 Powerful Results of Expressing Gratitude helpful as well.